Myles and I have continued to spend a few hours a couple of times a week on our DIY Book Scanner. As you can see below, it is mostly complete at this point. Yesterday, we finished putting the physical parts together, figured out how to hang the lights, and made sure that the cameras could focus correctly on the pages (as well as get external power). The only thing left to do with the body of it is to hang a counterweight from the pulley at the back. This will allow us to raise and lower the platen without putting a lot of force on it. Sooner or later, we expect to rebuild the platen as we learned a few things while doing it and the acrylic that we are using tends to build up a big static charge, which holds onto the pages from books. You can see our overall build progression in my Flickr photo set. Our next step is to get all of the electronics working. This is non-battery power to the cameras and a foot switch to cause them both to take photos. We’re using a linux virtual machine with the open source scanning software so people should be able to run the software on any computer at Ace Monster Toys, assuming they install VMware’s tools. One of the discussions that Myles and are having is how we could build a book scanner from scratch in an easier fashion, using some sort of standard parts and maybe molded corner pieces or some sort of interlocking system. 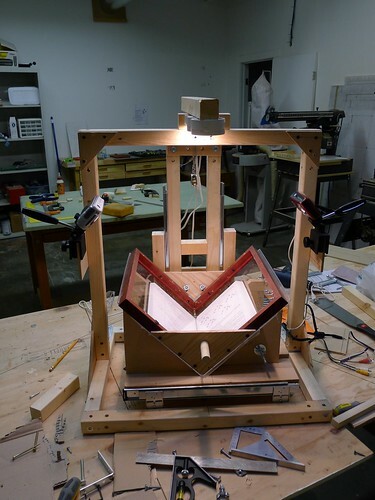 The idea would be to create an easy to assemble set of parts that we could then turn into kits, making it easier for other people to build their own book scanners without staring at pictures of the builds of others on the DIY Bookscanner forums and figuring it all out for themselves. These conversations are just in the beginning stages but it seems worthwhile to discuss.